NES Moai-kun (JPN) in 12:57.29 by aiqiyou & J.Y. Moai-kun is a fun, fast-paced puzzle-platformer where the goal is to rescue all your pink friends and then reach the door - to continue to the next stage. It has a surprising amount of action for a puzzle game. In this run, all 56 levels are well-solved and well-played. 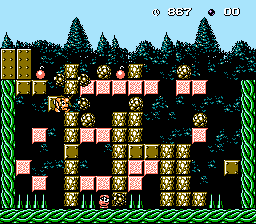 There are some unexpected twists, such as going through walls, that allows levels to be beaten much faster than normal. The authors, aiqiyou & J.Y, beat Randil's movie by 2:01.25 minutes. The improvement is so huge thanks to new strategies and tricks used, a new glitch found, and more effort invested into fighting lag.